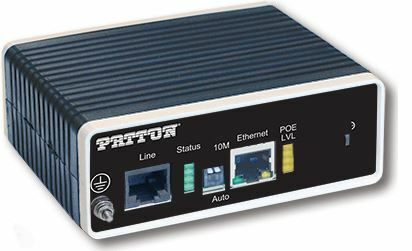 Patton’s CL1101 CopperLink PoE Extender Kits allows you to connect Ethernet powered devices over previously installed copper infrastructure. You can now reuse circuits previously meant for traditional non-IP applications such as alarms and analog phones, and instantaneously install PoE compliant devices like IP Phones with no added overhead costs. Desktop and industrial units are pictured above. 2 Pack kits (-2PK in the part number) include (1) local unit and (1) remote unit. Now you can extend Ethernet and power to compliant or legacy PoE devices using already installed twisted-pair cable or coax. 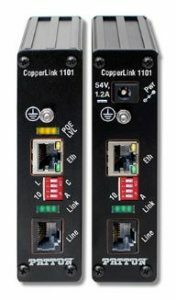 PoE line power enables the distant CopperLink to power itself from the local CopperLink and provides about 15 Watts of power to its PoE Ethernet interface. These devices are perfect for wireless access points WAPs, IP cameras, IP telephones, IP door stations, HVAC controls. Now you can put those devices WHERE you want them — you don’t need a power outlet nearby. Call for pricing or for more information.